In a medium saucepan, combine the milk, white chocolate, vanilla and salt over medium-low heat. Heat, whisking frequently, until the chocolate is completely melted, but do not let the mixture come to a boil. Remove from heat and stir in peppermint extract, if using. 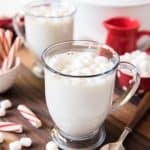 Pour into mugs and serve with marshmallows, whipped cream, white chocolate shavings, crushed candy canes or sprinkles. Recipe adapted slightly from The Recipe Critic.